Chicken Tikka Masala is one of India's most-famous culinary exports. Use your pressure cooker to make this flavor-packed version of the classic Indian dish in about 30 minutes! The spicy heat from the cayenne pepper in this dish is cooled down by the addition of Greek yogurt and cream. Using smoked paprika in the spice blend in this recipe imparts irresistible smoky notes to the final dish. 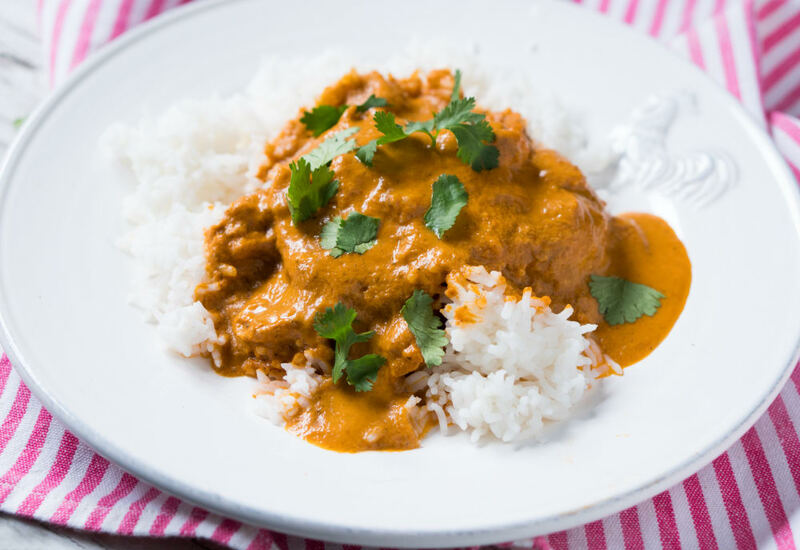 Serve this Pressure Cooker Chicken Tikka Masala over a bed of fragrant basmati rice. For a lighter take, replace the heavy cream with more yogurt! This dish looks beautiful with a fresh burst of color just before serving. Either fresh cilantro or fresh parsley works great. Per Serving: 579 calories; 33g fat; 16.6g carbohydrates; 54g protein; 200mg cholesterol; 509mg sodium. I love traditional tikka masala, and this recipe does not disappoint. The sauce has authentic flavor, thanks to the garam masala seasoning and other spices. Instead of heavy cream, you can probably also substitute with coconut milk as well. Never made this dish at home before and always have when I'm out at restaurants. Making this in the pressure cooker was so easy. I bought garam masala and now want to use it in everything I make. Took advice above since I like going light on dairy and used coconut milk! Used yogurt instead of heavy cream and lots of parsley for garnish. This is really delicious and is perfect with basmati rice and a side of naan bread. The whole family enjoyed this. Made it with chicken and another with vegetarian chicken strips for the non meat eaters. Both version were completely delicious. Didn’t change anything in the recipe. Excellent ~ We served with Basmati Rice and Greek Yogurt. The dishes were wiped clean with Naan Flatbread. I made this tonight for my family. I thought I had tomato purée on hand, but ended up using tomato sauce. It was a bit thin, but the taste was fabulous! I used the yogurt I made in my Mealthy MultiPot in the recipe. I love my Mealthy. Delicious, my family is very picky with food, but this chicken was a hit. I’ve made it sans the cayenne pepper. But totally recommend it. Made this with my kids (8,11 and 12) and the whole family loved it ! Loved this using coconut milk vs cream & yogurt! I followed the recipe exactly as written but it was a bit too tomato-y for me. It was very good and my husband loved it. Will definitely make again but might try to reduce the over powering tomato aspect. It was better than the slow cooker recipe I have made in the past. This tasted delicious, but it turned out a little thinner than I like my tikka masala. Any suggestions? Maybe the cornstarch (above) would be good. I thought the flavors were great with this recipe. For the tomato purée I actually made it up myself and I think that may have contributed to the very thin consistency of the final product. I added a 3 tablespoon cornstarch slurry to the final prep and that brought it up to the consistency it needed to be. Very good, will definitely make again. Phenomenal. Made this twice now, and it turned out great. Girlfriend has been to India a couple of times and loves this recipe. Looking forward to making it again. Underwhelming. I substituted two T of Chicken Tikka Massala spice I brought back from a three week trip to India where we fell in love with the food. I should have used 4 or 5. This was very, very bland.